Meghan Hetrick’s Strange. | The Sketchcard Saloon. ← Ink-Stained Rumble: Tinkerbell vs. The Maxx. That is a four-card puzzle that is really strange. It was inserted into a random pack of Marvel Universe cards by Rittenhouse Archives. It was created by Meghan Hetrick, and it is simply bizarre how much magnificence she can fit on such a tiny cardboard canvas. Witness, for example, three of her Runaways. There is an otherworldy quality to these small wonders. Here at the Sketchard Saloon, as you may have noticed, we are particularly fond of finding new and unusual artistic interpretations of the Squirrel Girl mythos. Meghan Hetrick does not disappoint, once again. Our final showcase card for the day slips a spectacular bonus tree rat into a portrait of Excalibur’s Meggan. 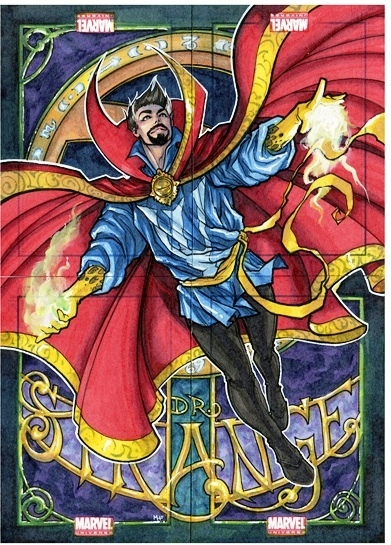 Strange how beautiful a sketchcard can be. This entry was posted in Artist Spotlight, Squirrel Girl. Bookmark the permalink. 1 Response to Meghan Hetrick’s Strange. Meghan Hetrick is definitely an ‘Illustrator Supreme’ – absolutely one of the very best the sketch card industry has to offer.